Selectman John Gray addresses the audience during Brooksville town meeting on March 5. At right, moderator Bob Vaughn. Voters at the annual town meeting Tuesday postponed a vote on whether to sell a small parcel on Young’s Point Road to give the town time to consider other options for the land, specifically, to consider donating it to a conservation trust. Selectmen had sought permission to sell a 2.43-acre lot donated to the town by Sumner Lymburner many years ago. They planned to combine the parcel, which is landlocked with no legal access from the main road, with an adjacent lot the town had acquired through foreclosure. Selectman John Gray said that because voters had voted to accept the gift, they have to now vote to sell it. Voters, however, were not in the selling mood. Ralph Chapman questioned whether the parcel was near the Snow Natural Area along the Bagaduce. Turns out that one corner of the Lymburner property abuts the nature preserve. In fact, residents had previously eyed the parcel for creation of a nature path and an alternative access to the preserve. Joan MacCracken said she had worked with different agencies to develop trails on the property, but dropped her efforts after the access issue arose. Much of the discussion then focused on whether the town could sell the two parcels to Blue Hill Heritage Trust and floated several unofficial amendments to the article to that effect until one person questioned whether the trust was interested. Barbara Kourajian then asked whether the town could donate the property to the trust. In the end, Abbie McMillen, who had been on the board of the local land trust when the Snow preserve was created, formally motioned to postpone action until the next town meeting. Voters expressed concern that the warrant article dealt only with the sale of the Lymburner property, but selectmen indicated that the sentiment of the town meeting was to keep the two parcels together and to postpone action on both of them. “We’ve heard you,” Selectman Hal Snow said. Voters also gave the road crew a raise. Sarah Cox proposed the wage increase noting that the road commissioner had not had an increase from the $20 per hour rate since 2012 and that it had been since 2013 since the rest of the crew had seen a raise. “I think that is unfair to those who work very hard for us in all kinds of weather,” she said. Her proposal to raise the road commissioner’s wages by 15 percent and the road crew by 10 percent, was approved without dissent. In response to questions, Gray said there should be enough money in the road budget to cover those raises. 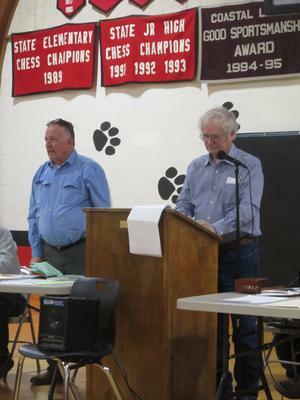 Residents raised some questions on the remaining municipal articles, but approved them. They also approved the $1.9 million school budget without comment. Superintendent of Schools Mark Hurvitt explained that the budget represented an increase of $82,266 or 4.36 percent above last year. The increase stems mainly from the addition of an Ed Tech position at the elementary school and also reflects an increase in tuition for more students attending high school next year. Two new members, Despe Lebel and Barbara Blake-Chapman, joined the school board on Tuesday having won the two open seats in Monday’s elections. Lebel received 72 votes; Blake-Chapman received 81. There were no contested races in the other municipal elections. The results of the voting included John Gray, selectman, 84 votes; Amber Bakeman, town clerk, 85 votes; Yvonne Redman, tax collector, 83 votes; budget committee-Earl Clifford Jr.,80 votes, Dana Hooper, 81 votes, Andrew Ladd 76 votes; planning board, Gerald Gray, 81 votes; Freida Peasley, treasurer, 83 votes; Matthew Dow, fire chief, 72 votes; and Mark Blake, road commissioner, 80 votes.